If these can both be done with the same conclusion reached then we can consider the knowledge to be scientifically true! 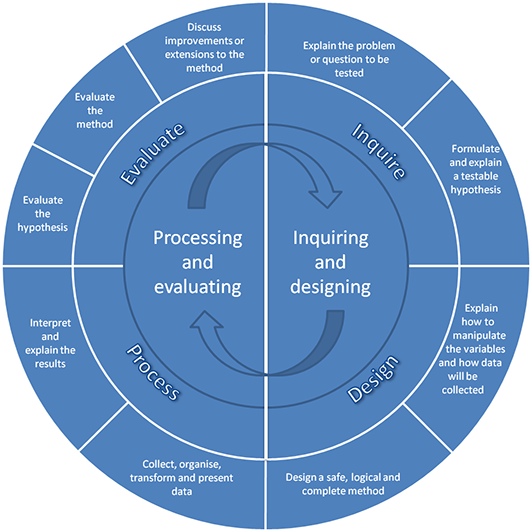 Processes invovled in the scientific method. Variables (independent, dependent and controlled). The first part of the Lab Report is done BEFORE you do the experiment and is evaluated under Criteria B. This title will depend on the topic given to you by your Teacher when you carry out your own investigation. Investigation into how ____(1)___ affects __(2)____ . Any useful information you can find about your research question. This information is used to help write your hypothesis. A statement of what you think will happen in your experiment and a scientific reason why. These are the things in your experiment that will change. There are always 3 types of variables in an experiment. Independent - This is the 1 thing in the experiment that you will be changing. You should state the variable and then explain how you will be changing it and any relevant units. Dependent - This is the 1 thing in the experiment that you will be measuring. You should state the variable and then explain how you will measure it and any relevant units. Controlled - These can be many things in the experiment that we must try to control so that the experiment is a fair test*. You should state each control variable and how each one will be kept the same. A list of the lab equipment and chemicals that you will use. 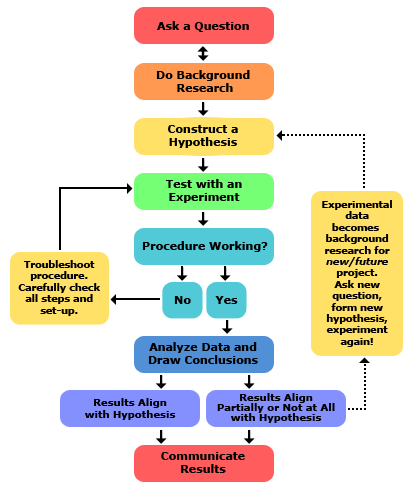 A list of the steps that you will carry out to perform your experiment and collect all your data. The second part of the report is copleted DURING and AFTER the experiment. It is evaluated under Criteria C.
Calculations - If you need to carry out calculations with your data then it is good to show at least 1 example of how you did it. You can do this underneath the table of data. Graphs - A bar graph or line graph should be used to display your data (your teacher will tell you which one to use). They must also be drawn in pencil with a ruler. A good graph will contain: a title that starts with “A graph to show…”; labelled axes with units; data points marked accurately with an “x”; and a line of best fit (only with a line graph). Check the next page to see more detail on drawing graphs. To write a good conclusion you must: state what your results show (and describe the shape of the graph if you have one); compare your results to your hypothesis; explain your results with scientific knowledge. Answer and explain these questions: Did you carry out the experiment accurately and how you know? Did you make any errors and how? Did you control the controlled variables well? How could you improve the method so that your experiment was more accurate? A list of the sources that you have used to find information that has been used in the report. It should be recorded in a special format called the APA format. 1. Smithers thinks that a special juice will increase the productivity of workers. He creates two groups of 50 workers each and assigns each group the same task (in this case, they're supposed to staple a set of papers). Group A is given the special juice to drink while they work. Group B is not given the special juice. After an hour, Smithers counts how many stacks of papers each group has made. Group A made 1,587 stacks, Group B made 2,113 stacks. d. What should Smithers' conclusion be? e. How could this experiment be improved? 2. Homer notices that his shower is covered in a strange green slime. His friend Barney tells him that coconut juice will get rid of the green slime. Homer decides to check this this out by spraying half of the shower with coconut juice. He sprays the other half of the shower with water. After 3 days of "treatment" there is no change in the appearance of the green slime on either side of the shower. a. What was the initial observation? e. What should Homer's conclusion be? 3. Bart believes that mice exposed to radiowaves will become extra strong (maybe he's been reading too much Radioactive Man). He decides to perform this experiment by placing 10 mice near a radio for 5 hours. He compared these 10 mice to another 10 mice that had not been exposed. His test consisted of a heavy block of wood that blocked the mouse food. He found that 8 out of 10 of the radiowaved mice were able to push the block away. 7 out of 10 of the other mice were able to do the same. c. What should Bart's conclusion be? d. How could Bart's experiment be improved? 4. Krusty was told that a certain itching powder was the newest best thing on the market, it even claims to cause 50% longer lasting itches. Interested in this product, he buys the itching powder and compares it to his usual product. One test subject (A) is sprinkled with the original itching powder, and another test subject (B) was sprinkled with the Experimental itching powder. Subject A reported having itches for 30 minutes. Subject B reported to have itches for 45 minutes. c. Explain whether the experiment supports the advertisements claims about its product. Your ​experiments should generate data that you can write down. A good place to write your data first is in a table, so it is organised and you might be able to see a pattern. If you have your table prepared before you start your experiment it will be much easier in the lab, and you can check you are using the correct units, so make sure you write them in the table! You are going to draw a graph using the video below, where students are stacking cups on top of each other for 15 seconds. You will put time (s) on the x-axis, and Height of stack (cm) on the y-axis. You can also use this information to draw a table. Normally the thing you are changing (independent variable, x-axis on the graph), goes in the first column. The thing you are measuring (dependent variable, y-axis on the graph), goes in the second column. 1. Draw a table to write the results in from the video. 2. Draw a graph using your results in the table. 3. Compare your results with a friend´s table and graph. Are they the same? Are they slightly different? Why? How could we improve the results?